Have you started your Holiday Shopping as of yet? Christmas is right around the corner! Can you even believe it? I've had many ideas floating through but haven't made any purchases. This year I am hoping to save as much money as possible but give the best gifts! Groupon Goods has a lot of offer anyone! Hair brushes, batteries, or even Bluetooth Shower Speakers can be found in a quick search of their website. Saving money while enjoying the goods and services is the top reason Groupon is my go-to when I am looking for a little fun! 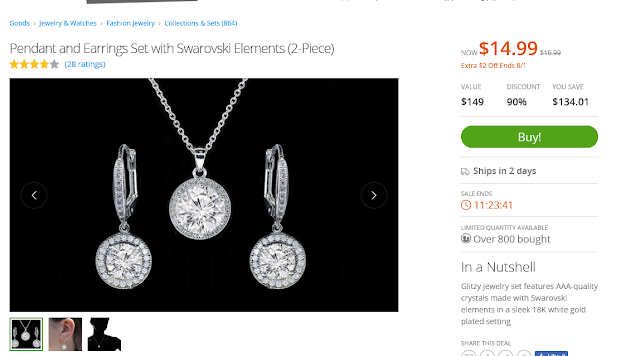 Today as I'm browsing through the Groupon Goods section, I see beautiful diamond earrings on the top of the page. Of course I feel the need to have these for myself, but think of many of my friends that would love them too! Must Share! If diamonds aren't you thing, keep looking. My husband loves that Groupon Goods offers simple things in life like a charging station and Xbox One games in the same place that you can find diamonds and perfume! Purchasing online is a lot easier than dealing with the hustle and bustle of the physical store, so the husband spends a lot of time poking around on Groupon, finding deals that work for him. Whatever you may be looking for, do what I do and search for it on Groupon Goods. It's a great place to search for not only holiday gifts, but you can grab birthday gifts and gifts for Thursday right there on Groupon Goods! What kind of deals have you snagged from Groupon Goods?